I will always remember Zombie 3 (1988) as my first Lucio Fulci disappointment, I adore Zombie (aka Zombi, aka Zombie Flesh Eaters) which was an early Fulci discovery for me, and I was working my way through his filmography when I happened upon this strange little film, which was advertised as a sequel to his seminal gore and atmosphere soaked zombie classic. I went into this one sight unseen with huge expectations, and what I got was a fever-dream of poor filmmaking that feels like an inept nightmare you cannot wake up from, and while a fever dream nightmare could describe a number of Fulci classics this was like that only in a bad way. 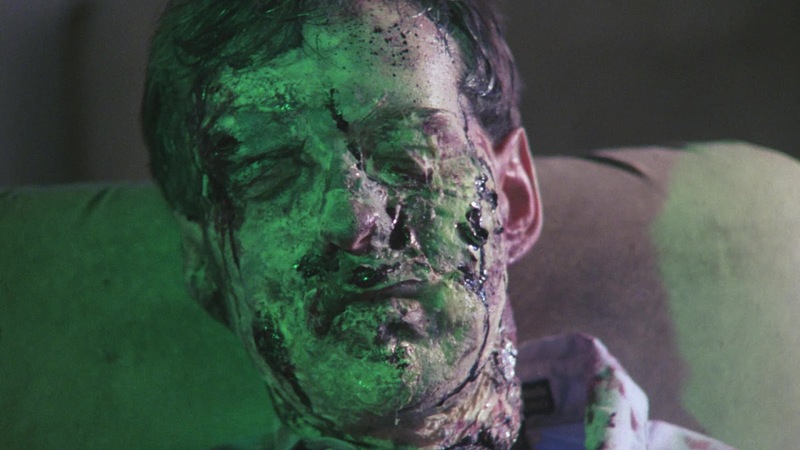 The premise begins with a military lab where scientist are working on a biological weapon called "Death One", we see it reanimate what looks to be a dead corpse in a glass tube, the experiment nearly goes out of control, and the scientist recommends that all trials end immediately. Then a terrorist steals a sample of the bio-weapon and ends up infecting themselves and releasing it into the wild where it infects the Filipino population who transform into highly-mobile infected/zombies bent on ruining the day for a trio of soldiers om a weekend pass and five friends on a road trip in an RV, who converge at a dilapidated hotel. 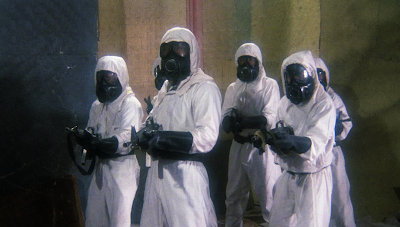 Together they must defend themselves not just against the infected hordes but a military crew bent on killing every last soul in the area, infected or not, to clean-up their mess. 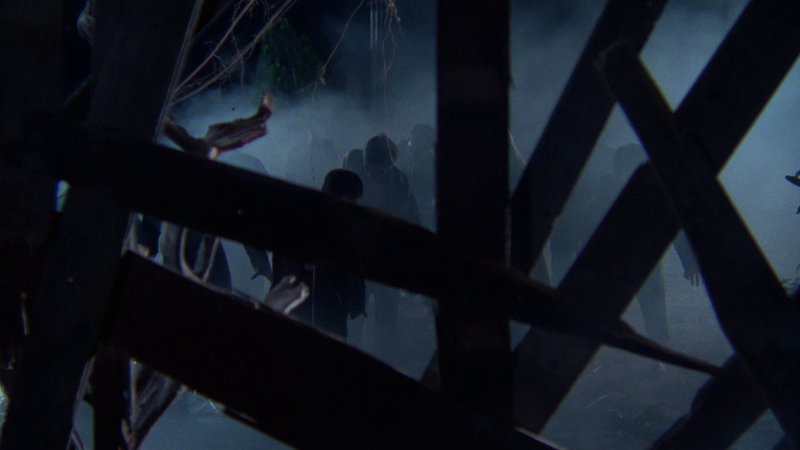 Part of the problem of this one is revealed in the extras that accompany the film, Fulci was not happy with the production which was underfunded and under-prepared, resulting in Fulci losing interest in the film, he ended-up leaving due to either his own illness or disinterest, it's not exactly clear, the extras offer various interpretations. Anyway, after his departure original screenwriter Claudio Fragasso (director of Troll 2) and second unit director Bruno Mattei (director of Rats: Night of Terror) were brought in by the producer to rewrite and film additional scenes, and the end result is a bit of a demented nightmare on film, it's trashy and lo-fi, but not without some cheap Italian charms and low-budget gore. 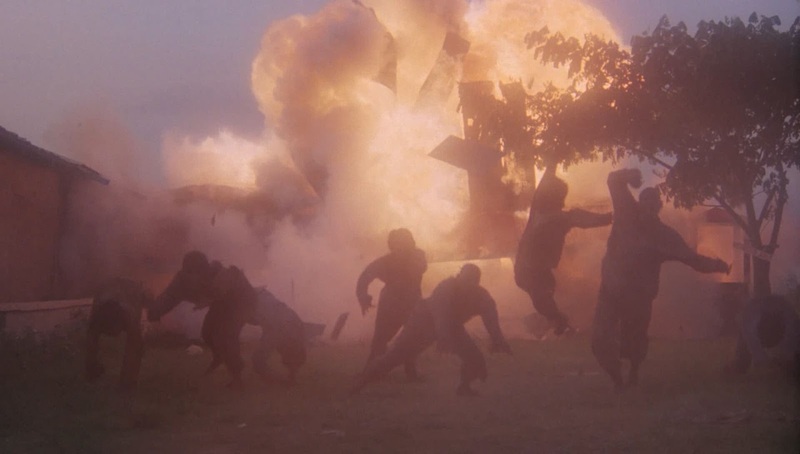 The special effects here were created by Franco Di Girolamo (Nightmare City) and the infected running around look a bit like the Hell of the Living Dead/Nightmare City variety, nowhere near the zenith of what we saw with Fulci's Zombi, these are cheap looking and often comedic in how bad they look, we get both the shambling variety and the more limber parkour type like 28 Days Later, jumping out of the trees and even using machetes and a bit of kung-fu, it's a mixed bag but no un-entertaining in a trashy sort of way. The highlight for me was the disembodied head that defies physics by flying out of a refrigerator and latching onto the neck of a victim, it's so bad, but it oh so good. The hybrid film is a mixed bag, admittedly it's mostly awful but there's still some interesting stuff, some of it borrowed from other films, like we have a recurring blind DJ who cuts in from time to time that brought to mind Vanishing Point (1971) and the cremation of infected remains that only serves to spread the contamination, this looking to be pilfered from The Return of the Living Dead (1985), but not as effective - and there's no cool tracking shot. Other cool stuff is the addition of infected birds attacking the living, which I think was a nice touch and a good way of spreading the contagion. As a sequel to Fulci's Zombie (1978) this is real bad stuff, but as just an bad Italian zombie movie it's certainly entertaining in a bad-movie sort of way, and an interesting footnote in the Fulci discography with a cool story behind it as told in the extras. 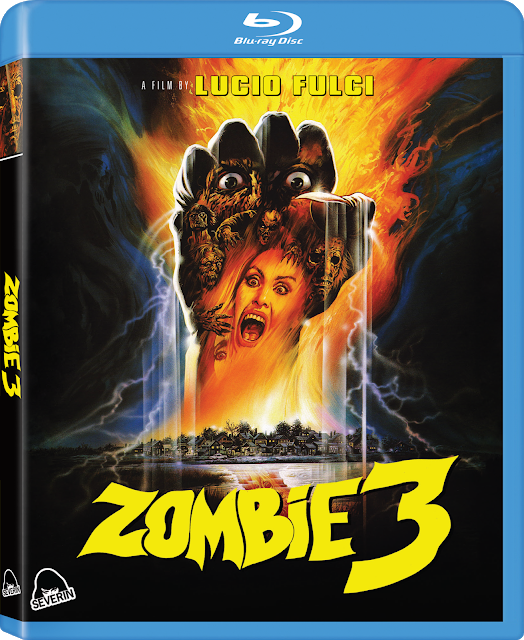 Audio/Video: Zombie 3 (1988) arrives on Blu-ray from Severin Films in 1080p HD framed in 1.85:1 widescreen, sourced from a new 2K scan of unspecified elements. This has always been an ugly movie, shot with that hideous diffused lighting style we saw in Shocking Dark (1989), but it at least looks better than the Media Blasters/Shriek Show DVD. Grain levels vary throughout, colors are more saturated and detail and clarity is slightly improved, but that's about all I can say positive about it, it's the best it's ever looked, but there's no wow-factor here. The only audio option is an English DTS-HD MA Mono 2.0 track, no subtitles are provided. The track is solid, the droney-synth score score from Stefano Mainetti sounds good, alongside cheese-metal tracks from Clue the Crew which will latch onto your ears and chew on them long after the movie ends. 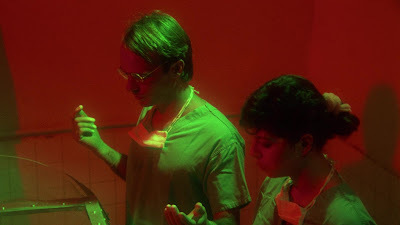 Extras begin with a new interview from Co-Director/Co-Writer Claudio Fragasso and Co-Writer Rossella Drudi who tell the tale of how Lucio Fulci was tapped for the project, his illness on set, disagreements with the producers, and how he left the project, with Fragrasso having to come back to re-write the film and co-direct the re-shoots with Bruno Mattei to finish the film. They discuss Fulci's liver cancer and how the Philippines were not an ideal shooting location for a man so ill, and in a way that sort of shirks Fulci's reputation Drudi says he was actually a very nice man, writing her letters to apologize for scenes he had to remove from her script because of the lack of budget on the film. They also discuss Fulci seemingly having his revenge on the producer's by shooting 20-90 minutes of canoe scenes, depending on who you believe. These interviews with Fragrasso and Drudi interviews that have accompanied are some of these Severin releases recently are some of my favrotite extras, adding context to this strange Fulci/Mattei/Fragrasso hybrid. The talk of Fulci is amazing, stories of him pulling out his own teeth, and going to a Filipino witch doctor to find a cure for his illness. They finish up with a fun story about Dario Argento and the film Wax Mask (1997), which was to be a film directed by Fulci, but after his death Argento offered it Fragrasso who turned it down. Severin also carry-over the extras from Media Blasters old DVD release of the film, we get the audio commentary With Stars Deran Sarafian and Beatrice Ring, plus three vintage interviews, the first with Actors/Stuntmen Massimo Vanni and Ottaviano Dell'Acqua who show up to discuss the shoot, what it was like shooting a film on the alleged sets of Apocalypse Now! and noting that rebels were fighting in the streets, and how Fulci fell through the wooden floor of a set only to shrug it off, that Fulci was a tough little bugger! Another vintage interview comes from co-director Bruno Mattie who discusses the stuff he shot, including the beginning and end of the film, plus all the stuff with men in white decontamination suits, claiming he shot about 40% of the movie as what Fulci shot was too short, also saying he feels all his film are terrible, and contradicting the stuntmen saying he never saw any of the rebellion happening at the time. Actress Marina Loi shows up for a brief interview discussing being cast in the film, and enjoying Fulci's sarcastic and intelligent brand of humor. The last of the vintage extras is an interview with FX Artist Franco Di Girolamo who walks us through his horror factory showcasing various gore-gags and props from his film like a head from Black Cat, and stuff Zombie 3, Night Killer among others, while espousing his love of practical FX. The last extra is a wordless three minute trailer for the film showcasing it's utter strangeness. 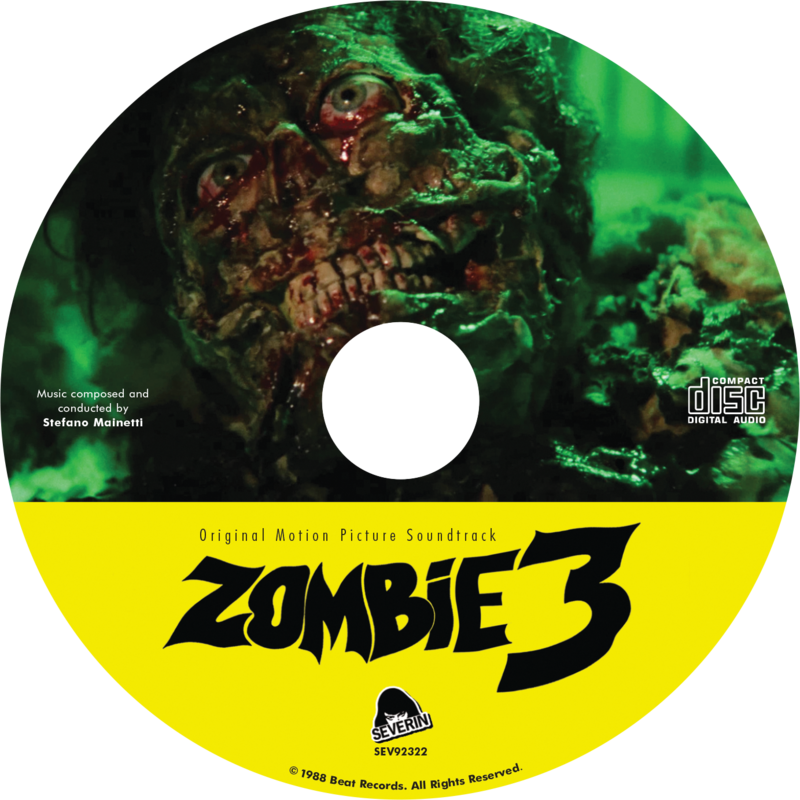 The 2-disc BD/CD release comes housed in a spiffy black Blu-ray keepcase with a one-sided sleeve of artwork. the disc also featuring the same key art as the sleeve, plus we get the CD featuring the droning synth score from composer Stefano Mainetti, intermixed with totally catchy progressive cheese-rock songs from the band Clue the Crew, no idea who they are but they are totally 80's and their song "The Sound of Fear" is now stuck in my head. 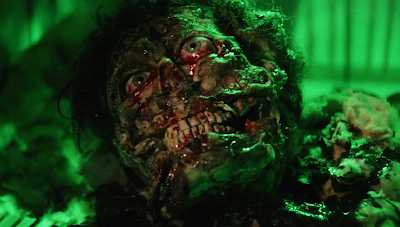 Zombie 3 (1988) is a bad film, a trashy hybridization with contributions from Fulci and cheesier elements provided by re-shoots by Bruno Mattei and Claudio Fragrasso, it certainly feels more like a Mattei/Fragrasso film than it does a Fulci film, but compared to some of Fulci's later work this isn't THAT bad, but it is bad. If you love schlock like Nightmare City and Hell of the Living Dead you need this slice of Italian/Filipino infected nuttiness in your life, and for you Fulci nuts it's worth it just for the extras which goes behind-the-scenes to tell the story of a doomed production, a lesser entry of the crap-tastic variety, and a film best not watched alone or sober.